From daily hairstyles to party and wedding styles, the choice of easy short pixie cuts for oval faces is wide. Oval faces are more or less the same shape as an egg held with the wider part at the top. Your forehead will be slightly wider than your lightly rounded chin and overall your face will be a tiny bit longer than the width. Here are this week’s best, new pixie cuts for oval faces to keep you up to date and looking great! 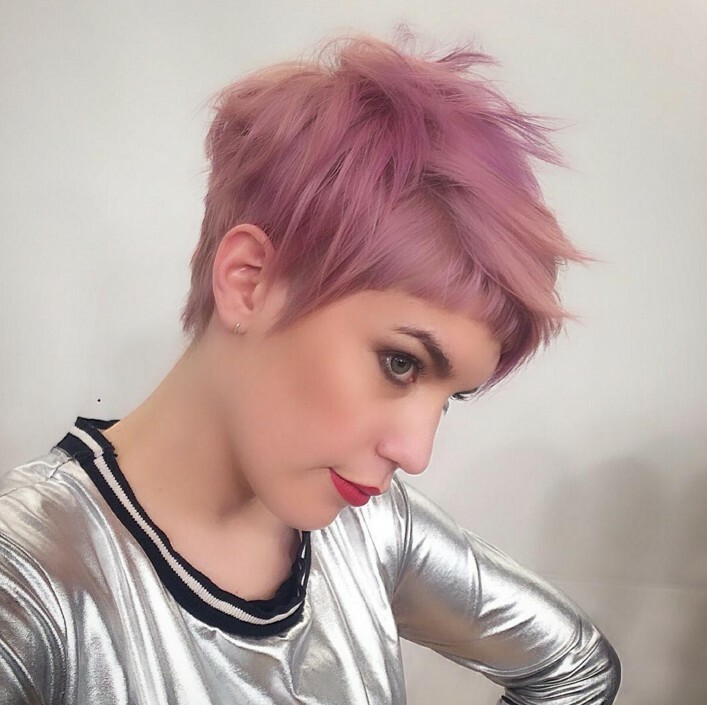 Get a hot, space-age look for a special event with this party pixie-cut that signals, ‘I’m a fun-to-be-with, high-fashion fan!’ This new colour is a mix of pale lavender and pink, giving it extra edge to match the messy finish. The sides are cut in sliced layers emphasising the vertical movement of the strands down to the sharp side-points. The short, full fringe is shorter in the middle, curving down to the sides in a flattering shape for oval faces. The mix of shaggy sections with the curved fringe and pinky-purple pastel colour creates a cute, young and futuristic party hairstyle! This clean-cut pixie is one of the most popular hairstyles this season, combining a very stylish outline with a lightly tousled finish. The profile of clean-cut, short hairstyles on oval face shapes looks so perfect. Adding height around the crown exaggerates the shape a little and shows off a well-shaped head. The fine, blonde highlights on dirty-blonde hair transform this simple hairstyle into a cute natural pixie-cut! 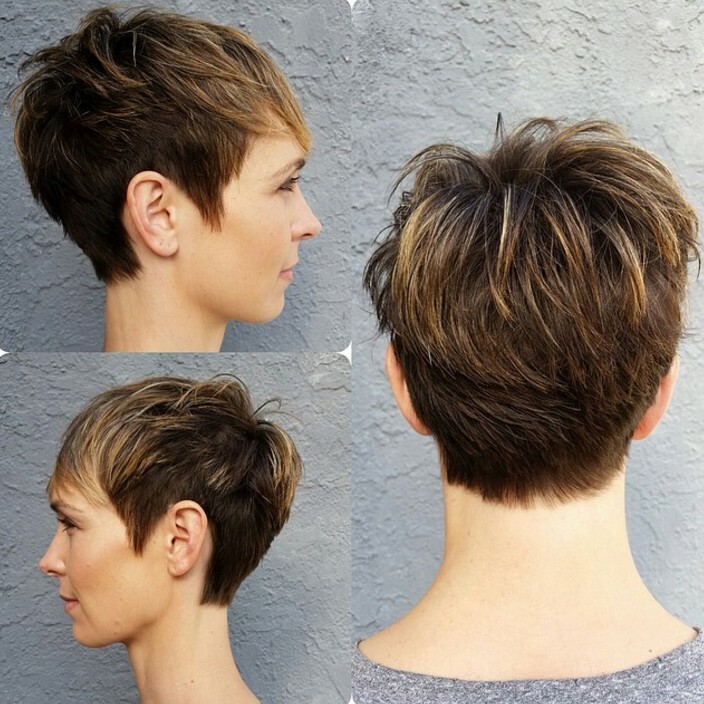 This chic, contemporary short hairstyle is suitable for medium and fine hair, as the dense layering and highlighting creates lots of natural volume, texture and movement. Whilst the medium bob suits this model’s face very well, the dark pixie cut makeover brings out all of her attractive features! 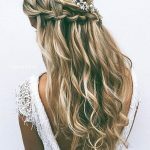 This daily hairstyles’ option for oval faces, is also one of the easy haircuts featuring in the latest popular hairstyles for spring/summer 2018. The model has dark eye-brows and eyes, so brunette short hairstyles give more (flattering) definition to her face. The neatly cut frame accentuates the forehead and draws attention up and away from a slightly large nose. With a tailored short hairstyle, you don’t have to spend ages fiddling with your hair to look your absolute best! 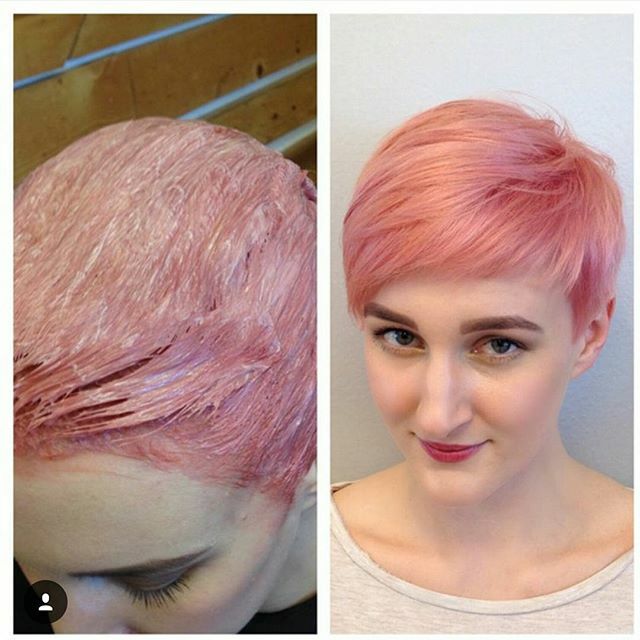 Hair color ideas for pixie cuts: Maybe you can’t wear anything too extreme for work, but this pastel pink shade should be welcome anywhere! It’s a super daily hairstyles choice for anyone who’s bored and wants to liven up their look, while sticking with simple, short hairstyles. Coral-pink looks good on pale complexions with subtle golden undertones. 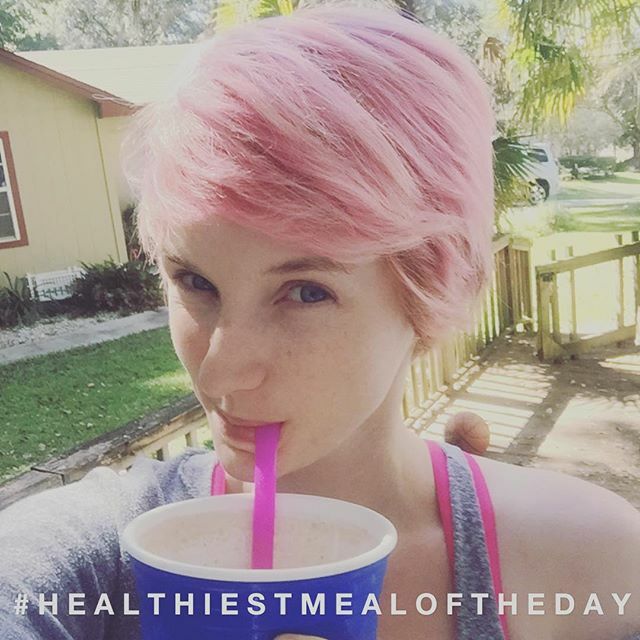 Best suited to pre-lightened or naturally blonde hair, this pink pixie features a blurred side parting, with a combed-over top and a short fringe with a blunt finish. You can achieve layered, easy haircuts like this on fine and medium textured hair types! 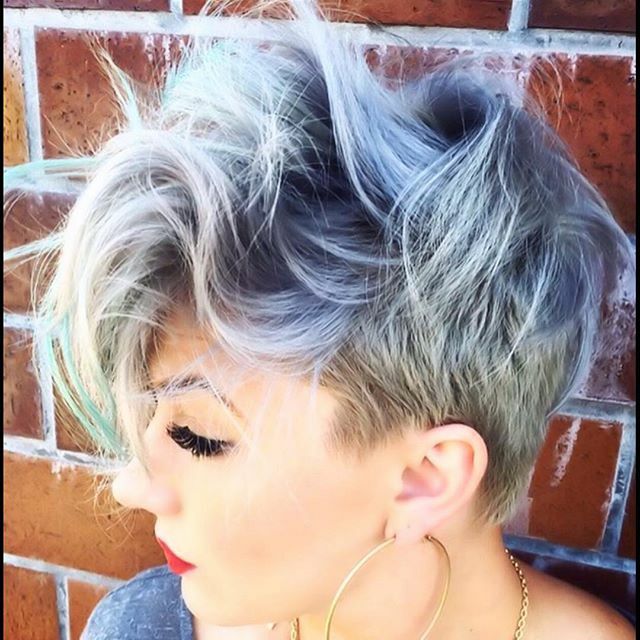 Here’s a radical pixie cut with a new twist on the asymmetrical buzz-cut that looks great on oval faces! One buzzed side continues up to a point that’s half-way across the top. 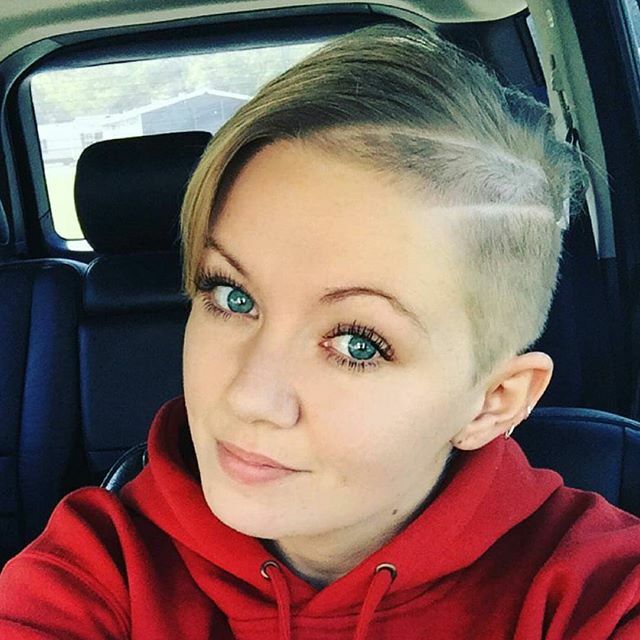 However, it’s the two shaved partings that give this young woman her fresh-faced and radical new look! 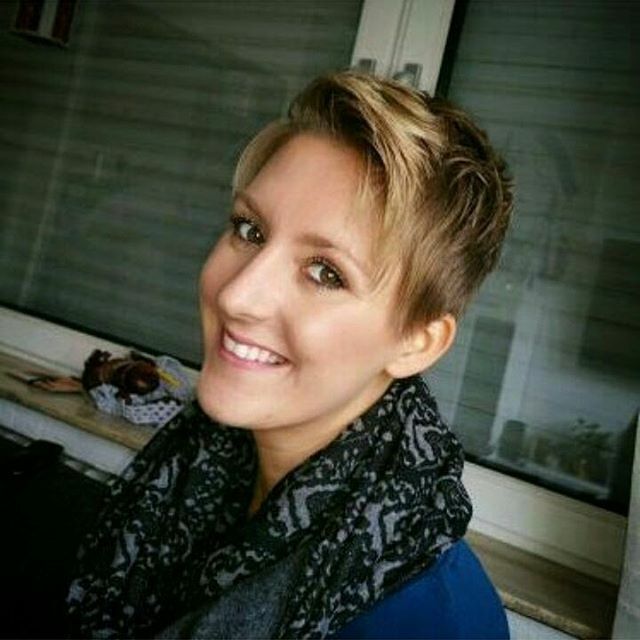 What a great example of the fashion impact simple hairstyles, like this perky pixie-cut, can have! This gorgeous vintage look suits an oval face perfectly and creates a very demure and soft natural look. The extended black eyeliner is pure 1950’s along with the pink lipstick, which along with the strawberry-blonde hair colour warm-up a pale complexion. Pretty pixies made divine daily hairstyles, which can easily be dressed up in scores of ways to make them stand out at a party! This avant-garde look will make you look like a very creative type! It’s extreme in lots of ways which, when taken all together, produce a stunning short hairstyles’ option for a special event. This is another good style for an oval face and thick, coarse hair – as the shaggy pixie cut relies on dense hair to create 3D texture and strong movement. There’s also a hint of indigo blue at the tips and as daring daily hairstyles go, this simple hairstyle is one of the most original and impressive! Here’s a stunning example of the best short hairstyles that create a stunning, arty hairstyle for oval faces. It’s one of the easy haircuts with a big personality based on a short back, sides cut around the ears and luxuriant, long layers on top. You can achieve this look on fine, medium and thick hair, as the lightening will add body to fine hair. The colours are gorgeous, with purple tones over a platinum-blonde base and amazing aqua balayage at the tips! And if that wasn’t cute enough, the deeply waved forward quiff makes this short hairstyle absolutely fabulous! Thick hair is great for creating the shaggy or windswept looks that are currently some of the most popular hairstyles. With so many casual, easy haircuts as daily hairstyles, I’m sure we’ll look back on this decade as a time amazing creativity! 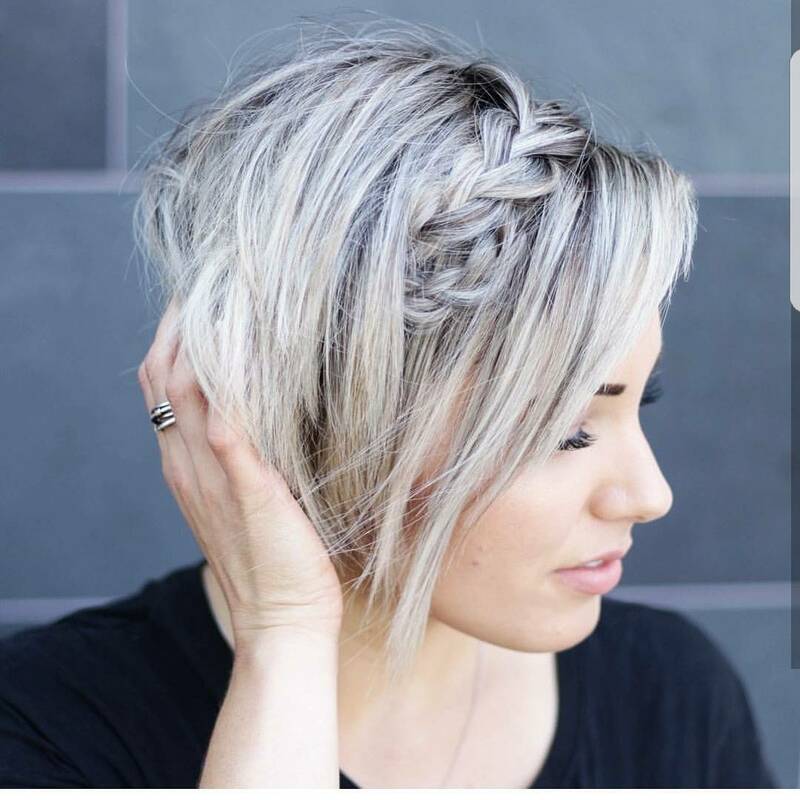 This beautifully textured short hairstyle shows how to work with thick, straight hair to create simple hairstyles that really flatter oval faces. The hair is combed forwards from the crown and lightly tousled before finishing in a softly, ragged-edge long fringe over the brows echoed by two short points at the sides! It’s a great pixie-cut for eye-focus! 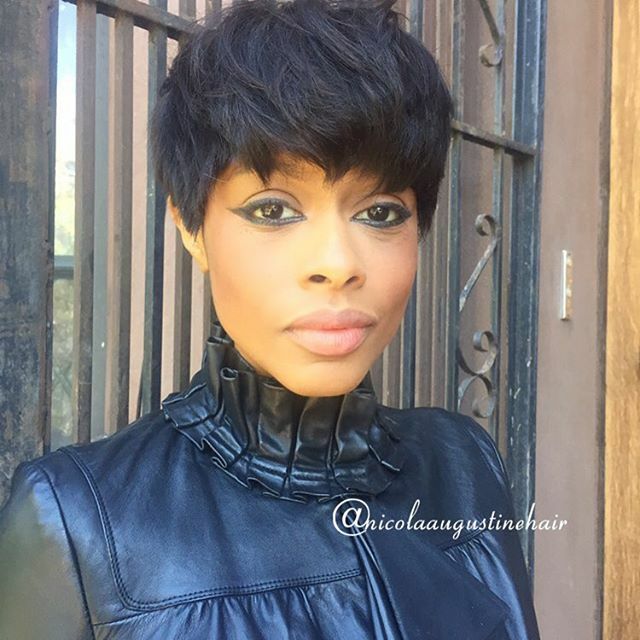 This messy pixie cut is great for black women. 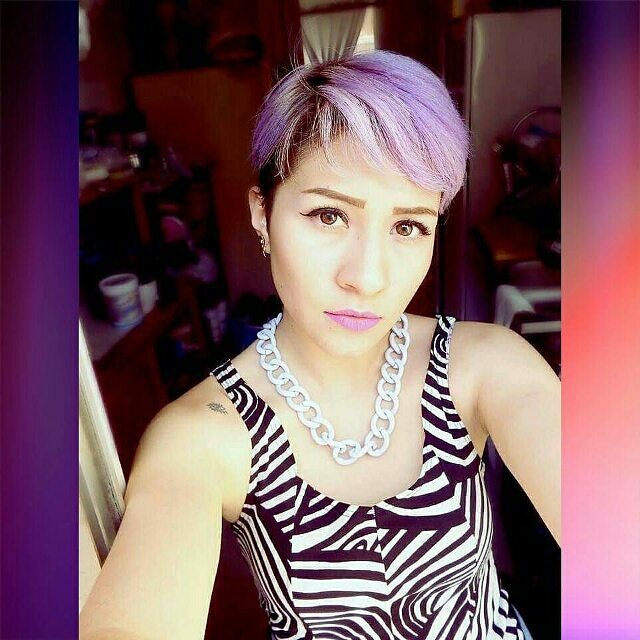 Of the many new, ‘rainbow’ colour ideas the purple toned, platinum-blonde pixie cut is currently the front runner. It’s just right for the party season, but equally good for fresh daily hairstyles in spring/summer 2018! Purple is a great colour for anyone with brown hair and brown, honey or green eyes – yes, believe it or not, purple colours really bring out the colour of green eyes! All asymmetrical, simple hairstyles suit oval faces and frame the eyes in a flattering way. Versatile short hairstyles can be smoothed down for cute daily hairstyles, before you ‘pump-up the volume’ with a stylish quiff for evening! One of the most popular hairstyles during the 60’s, this geometrical pixie cut is also one of the best, easy haircuts for anyone with thick or coarse hair. The coarse texture of thick, black hair allows the precision cut, stacked-back to create a fabulous rounded shape around the crown and back. There’s a lovely angle moving down to the forehead and from a side-parting, the long, steeply-angled fringe almost covers the eyes and meets the sharp side-points. Add a shaggy outline to these smooth lines and you have a fabulous contemporary look for an oval face and thick hair! Here’s an easy, but very fashionable, daily hairstyle for ladies over-50 who like to be fairly natural. 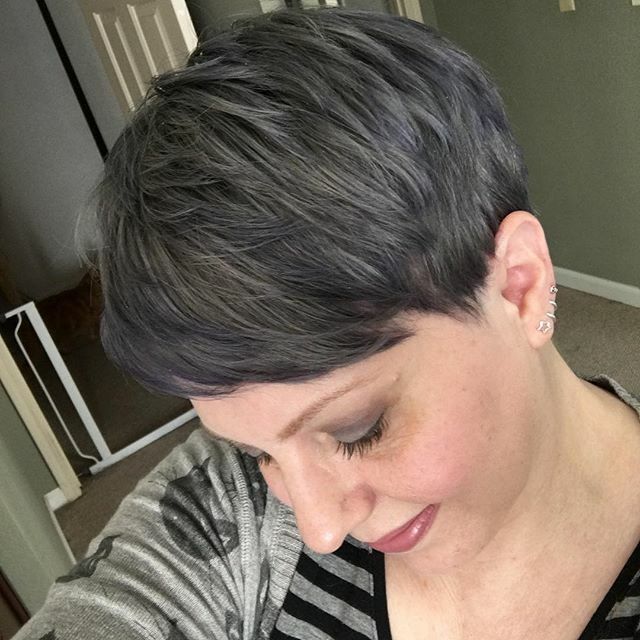 Perk up simple hairstyles on grey hair with subtle, purple balayage at the tips! 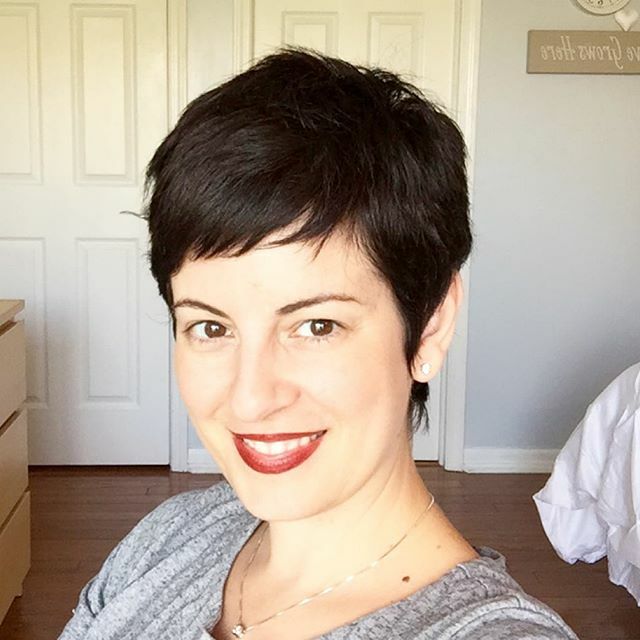 The swept-over layered pixie cut is one of the most popular hairstyles for mature women, as it flatters oval faces and most of the other face shapes, too. 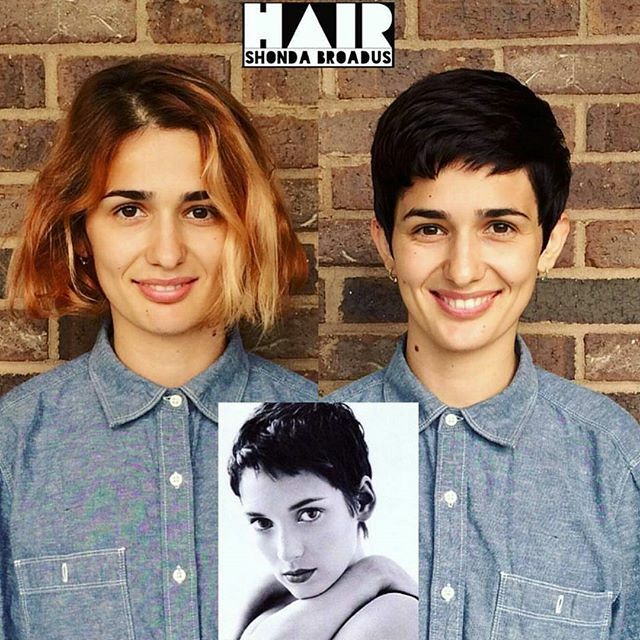 Plenty of layering adds volume to fine hair, making textured pixie cuts the best short hairstyles for adding body to thin hair – or getting control of thick hair, come to that! 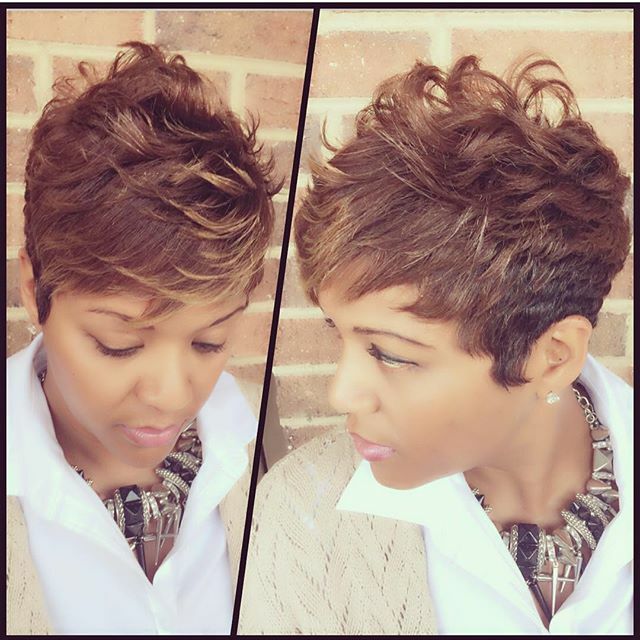 African American short cut ideas: the layered pixie cut. In easy haircuts for oval faces, there’s a huge range of daily hairstyles – but you can’t beat the appeal of gold-tipped pixie cuts. On thick curly hair, like the model’s, layering and then combing hair away from its natural direction creates a wonderful rippled texture at the sides. The asymmetrical profile has a fantastic zig-zag line with a reverse curl side-point at the ear and a shaggy fringe line on the forehead. The natural texture on top and around the crown is tousled to add flattering height. And really bringing all of this fabulous cutting to life, the golden tips accentuate the texture and movement beautifully! Cute short hairstyles for 2018: The asymmetrical pixie cut is not one of the most popular hairstyles just because we like easy haircuts – it’s also incredibly versatile! Short hairstyles allow us to experiment more with colour, in the salon or more cheaply at home. 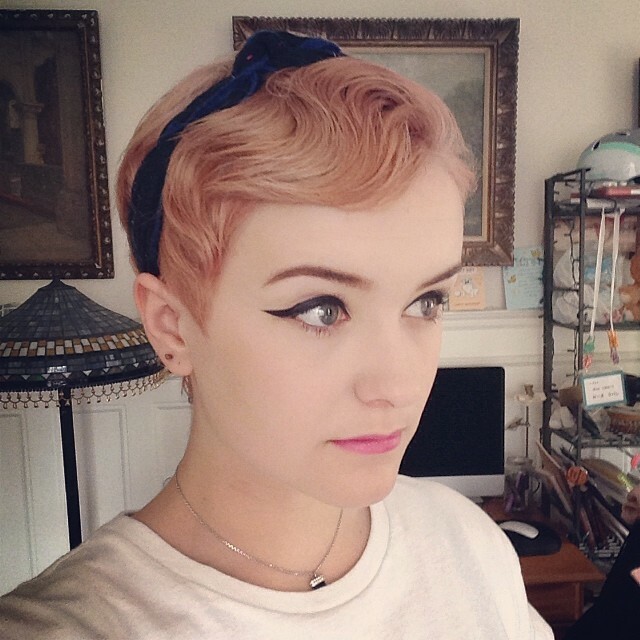 This image shows how eye-catching simple hairstyles can be with pale pink hair contrasted with blue eyes! Ask your colourist for suggestions on colours to suit your skin tone and accentuate your eyes. Oval faces don’t need to balance out their face shape as it’s already perfect, but this is also one of the popular hairstyles to add length to a round face or a low forehead. If you have an unlined or nicely rounded forehead it’s good to show it off with a little quiff creating a non-curvy wave around the top of your face. This cute and easy haircut can be achieved on fine hair and medium-thick hair types. Short hairstyles are a great way to create a lighter-toned frame around the eyes, which softens the face in a very natural way! If you don’t like cutting your hair too short, why not try the longer version of the pixie cuts? 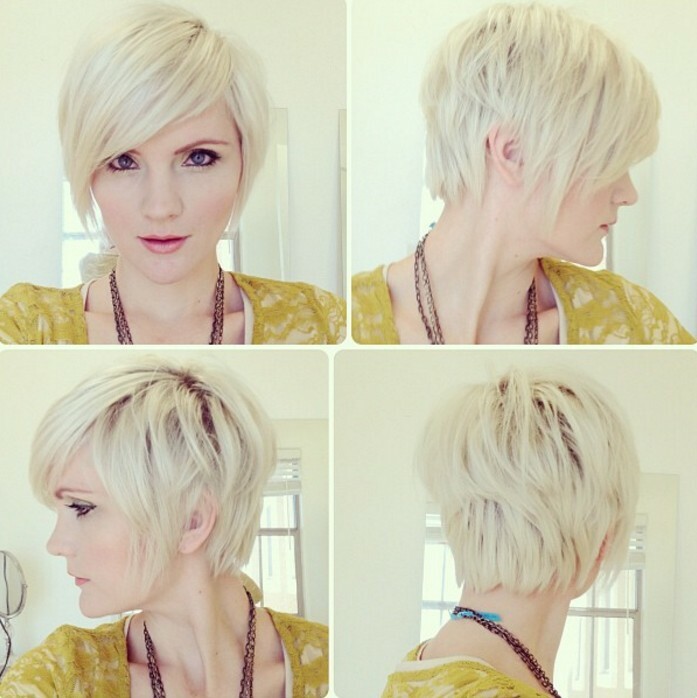 Here is a long blonde pixie cut with side side swept bangs. Short, dark and decisive is the vibe I get from this flattering daily hairstyles’ option, which flatters oval faces. 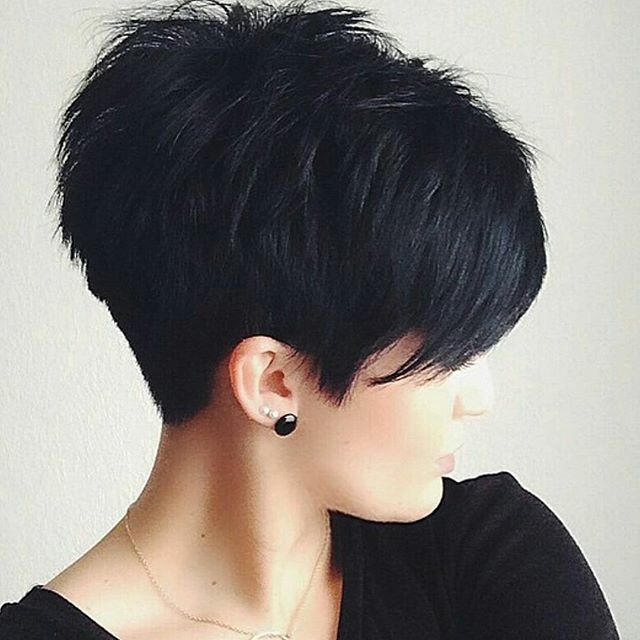 On thick or strong hair, the layered pixie cut is a great choice from the many short hairstyles on offer. It can be razored to remove all of the bulk and sculpted into a sharp, well-defined and contemporary shape that’s a super-easy haircut to style. This simple hairstyle is layered, so it’s also a great pixie cut for fine hair. The ends are lightly textured and the sides are cut in long side-points to balance the short, swept-aside fringe, with a cute, ‘broken’ edge softening the line! As you can see, colour is a big feature of these simple easy short pixie cuts for oval faces, so I hope you’ll find an exciting new colour twist to ramp-up your short hairstyles or realise that your naturally dark shade actually flatters you most! Daily hairstyles with a pastel tint are popping up in lots of unexpected places these days, so why not give it a go!